Stomach, liver and white muscle tissue samples collected by CEI’s Sustainable Fisheries research team were successfully received by the University of North Carolina Wilmington last week. This is part of a three-year project currently led by Dr. Travis Van Leeuwen, Danielle Orrell and Eric Schneider of the CEI Sustainable Fisheries Team in collaboration with Bonnie Monteleone (Plastic Oceans) at the University of North Carolina, Wilmington. The project aims to investigate the presence, toxicity and cycling of marine plastics across pelagic, reef and deep-sea organisms in the Exuma Sound. The study is important as the relationship between plastics in oceans, its cycling in ecosystems and its presence in our food remains poorly understood. Recent predictions made by the Ellen MacArthur Foundation and the World Economic Forum claim that by 2050 there will be more plastic than fish in the world’s oceans (The New Plastics Economy report, 2016). Understanding how the increasing presence of plastics in our oceans is affecting its inhabitants, and how plastics are cycling within different ecosystems (coral reefs, the pelagic ocean and the deep-sea) is key to raising awareness and identifying solutions. 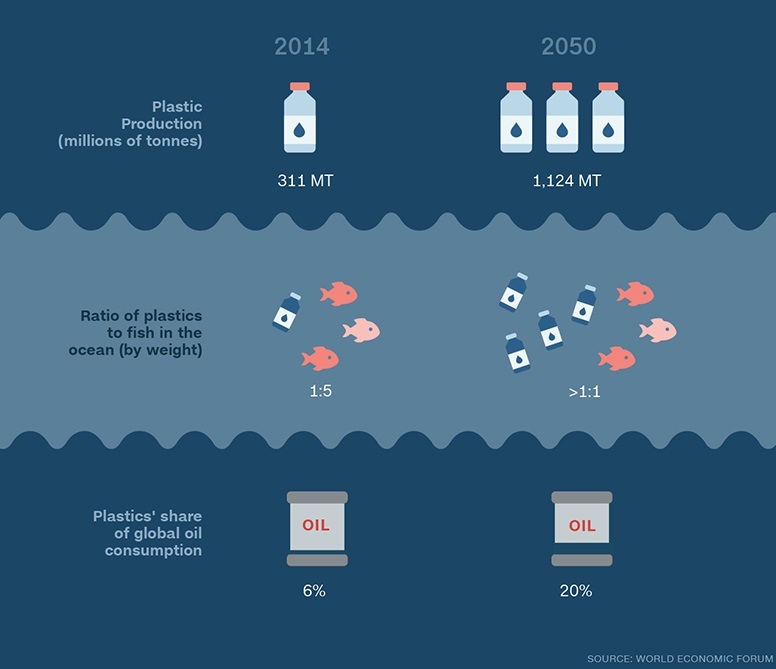 Changes in the ratio (number of plastics to fish in the ocean by weight) between 2014 and 2050, and the relative contribution of these plastics to global oil production as provided in The New Plastics Economy report (2016). The plastics project at CEI began in 2014, with liver, white muscle and stomach samples collected from pelagic fish such as mahi mahi, wahoo and tuna which were obtained from sport fishing tournaments hosted in The Bahamas. This was supplemented by fish caught during a Fall 2016 Island School class focused on investigating plastic accumulation in pelagic species. It is hoped that these samples will provide an insight into the plastic toxins present in fish which are often eaten by humans. Similarly, samples from reef fish including barracuda, mutton and yellowtail snapper were provided by local fishing boats and anglers, and deep-sea samples from animals such as isopods and eels were collected during deep sea research trawls carried out by CEI researchers in 2015-2017. These samples are now at the University of North Carolina Wilmington ready for examination by a team of biologists and toxicologists. Within the next few months it is hoped that these samples will help unlock some of the mysteries around plastic cycling within ecosystems, and quantify presence and associated toxicology associated with consuming these fish. 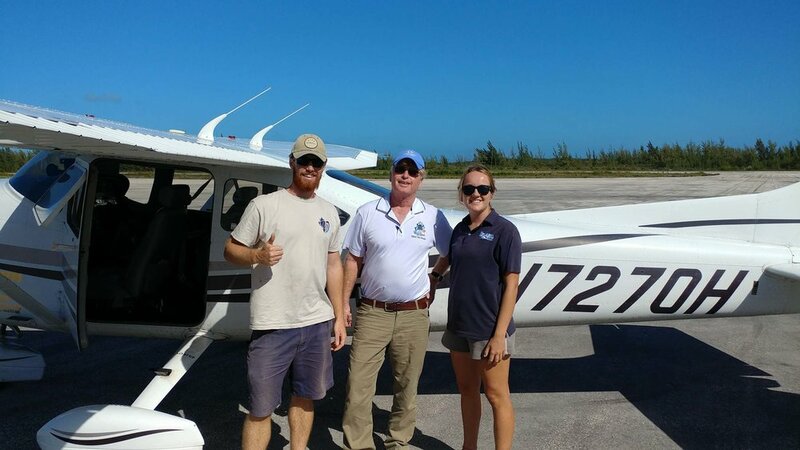 CEI researchers Eric Schneider (left) and Danielle Orrell (right) waving off Mark M. Steinberg (middle, pilot) transporting the samples to the US for analysis.